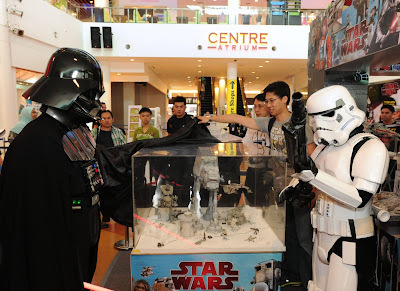 Malaysian science-fiction enthusiasts recently gathered to celebrate the 30th Anniversary of Star Wars Episode V: The Empire Strikes Back at the Hasbro Star Wars Toys Carnival held in e@Curve Mutiara Damansara, Petaling Jaya, Selangor, Malaysia. Fans of the infamous sci-fi saga by George Lucas had plenty to immerse themselves with thematic Star Wars activities encompassing the ground floor concourse of the shopping mall. Highlights included appearances by Star Wars characters, preview of upcoming Star Wars toys from Hasbro, an inaugral "lightsaber" wielding tournament, cosplay competition, and the largest Imperial Star Destroyer model spaceship in Malaysia. 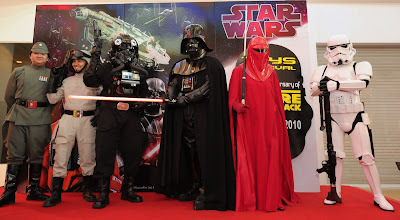 Special appearance at the Hasbro Star Wars Toys Carnival by members of the 501st Legion Malaysia-Brunei Outpost, local branch of an international fan-based organisation dedicated to screen-accurate costumes from Star Wars. Star Wars collectors had the opportunity of a sneak preview of upcoming toys from Hasbro, such as the iconic Imperial AT-AT Walker as seen in Star Wars movies soon to be released as a massive toy vehicle. Other preview toys included the infamous bounty hunter Boba Fett's helmet and blaster rifle, Snowspeeder vehicle and new range of action figures, specially unveiled by Darth Vader and his Imperial contingent of characters courtesy of the 501st Legion Malaysia-Brunei Outpost, the local branch of an international fan-based organisation dedicated to screen-accurate costumes from Star Wars. A number of costumers also reported in for duty, providing other characters from the Star Wars saga such as Republic-era Jedi, Mandalorian warriors, and more. Preview of upcoming Star Wars toys from Hasbro unveiled at the carnival by Darth Vader from the 501st Legion, a fan-based organisation dedicated to costumes from Star Wars. For a die-hard Star Wars fan like Ezli Eahsan, the anniversary celebrations brought back memories from a long time ago as The Empire Strikes Back originally released in 1980 was also his first cinema experience. The 33 year-old script writer was summarily awestruck that Hasbro's new Imperial AT-AT Walker toy vehicle previewed at the carnival is sufficiently impressive in scale to match the larger-than-life memory of seeing them on the cinema screen as a child. The activities also provided Ezli another venue to indulge in his hobby of costuming as movie characters, this time as the alien Jedi Master Plo Koon, of which he was delighted to win over RM500 worth of prizes from the Star Wars cosplay competition. About his thoughts on the carnival itself, Ezli hopes there will be more regular events like it as he is concerned on waning interest in Star Wars since release of the last movie (Episode III: Revenge of the Sith in 2005) which most people thought was the end of the series. Players of the Starship Battles tactical space combat game command spaceships from the Rebel Alliance or Galactic Empire represented by toy models as game props. 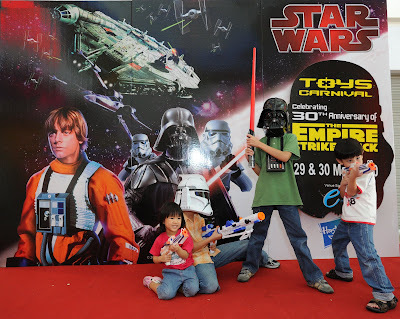 Fortunately, the Clone Wars animated television series currently on-air may be proving that interest in Star Wars is still strong with young Malaysians, who turned out in force at the carnival for the chance to playtest numerous Hasbro toys available for demonstration. Indeed, Star Wars fans of all ages took command of starfighters from the Rebel Alliance or Galactic Empire in the Starship Battles tactical space combat game using Hasbro toy vehicles as game props laid out over a massize floor-map. 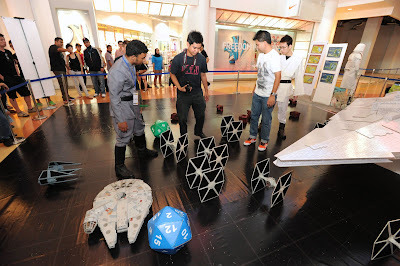 14 year-old Lim Chong Tat, who follows the Clone Wars, took the opportunity to widen his Star Wars fandom by joining the Starship Battles game to play a scenario from the Empire Strikes Back. Although he was defeated by opposing players controlling the Rebel Alliance, Chong Tat said he found the game fun and challenging and happy to take home consolation prizes of Star Wars toys. Contestants in the inaugral Star Wars "Lightsaber" Wielding Tournament showcase their skills. 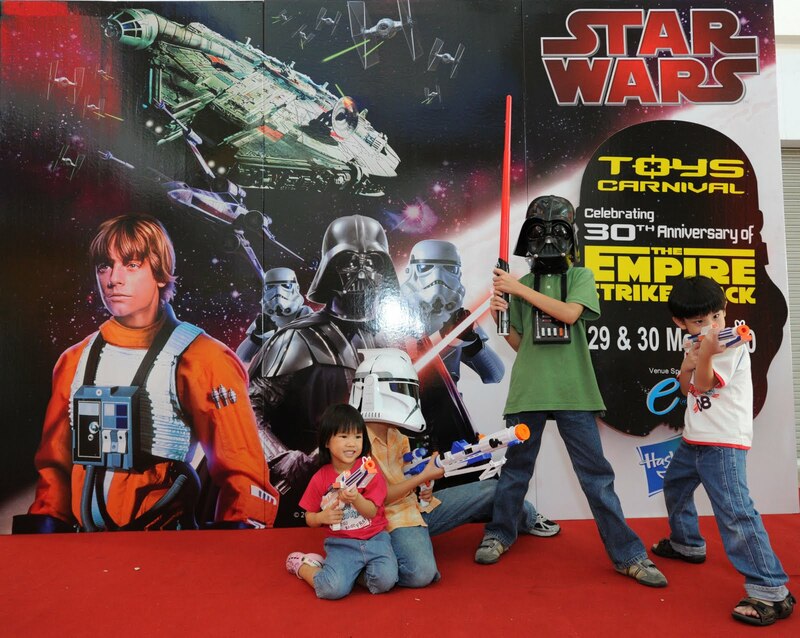 The Hasbro Star Wars Toys Carnival also hosted the inaugral "lightsaber" wielding tournament in Malaysia. Lightsabers are fictional weapons in the Star Wars saga consisting of a polished metal hilt which projects a blade of light able to cut through must substances and is most frequently used by the heroic Jedi Knights or evil Sith warriors. Following various demonstrations by fans to warm-up the audience, the tournament began with a handful of lightsaber "masters" showcasing their skills in cheoreographed performances, some even wielding two lighsabers with one in each hand. They were then tested on their ability to use lightsabers to deflect incoming projectiles and subsequently, for the selected finalists, to face off against one-again in mock duel. Ultimately Herbert Bandir Donald, 31, emerged as a audience favourite and winner of this inaugral tournament as a red lightsaber wielding Sith Warrior with a creepy masked visage. Star Wars fans gathered to celebrate the 30th Anniversary of Star Wars The Empire Strikes Back with a giant birthday cake shaped to the iconic Imperial Star Destroyer spaceship from the sci-fi saga. A core group of Star Wars fan friends topped off celebrations by commissioning a special Star Wars themed cake in the form of a giant Imperial Star Destroyer spaceship. Participants of carnival activities and representatives from contributing organisations gathered at the Preview Lounge in Cathay Cineplex for a dinner party with the giant Star Destroyer cake as dessert. Richard Chua, representative from MySciFiFan as co-organiser of some carnival activities, said that many Star Wars fans re-energised their interest in the sci-fi saga from the carnival and are looking forward to more Star Wars events in future, such as 30th Anniversary of Episode VI: Return of the Jedi in 3 years time. 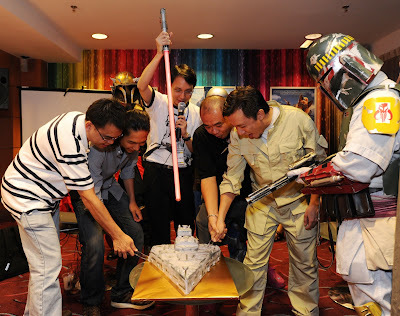 Check out more event photos at Star Wars Fans Malaysia Facebook Group. This event is organised by Hasbro Malaysia with activities and event management by Outpost Events at e@Curve Mutiara Damansara. The 2nd movie released in George Lucas' Star Wars saga and 5th chapter in the chronology opened in cinemas 30 years ago in May 21, 1980, becoming one of the most popular chapters in the Star Wars saga and one of the most highly rated films in history. It earned more than US$538 million worldwide over the original run and several re-releases, making it the highest grossing film of 1980. When adjusted for inflation, it is the 12th highest grossing film of all time.